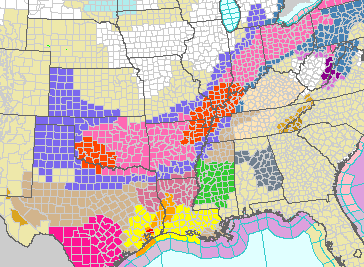 Orange areas are blizzard warnings, now including southwest Oklahoma and around Wichita Falls, TX in addition to the warning in the middle Mississippi Valley. The ice storm warning near the WV-VA border continues. The magenta area in south Texas is very high wildfire danger. Green in central Mississippi is a flood watch. Mike...I do not understand why a Winter Storm Warning would be issued for counties in which the weather service is only predicting a 20 or 30 percent chance of snow. Could you explain that reasoning? I am referring to the NWS Tulsa and some of their counties in NE OK. Sorry, you would have to ask the NWS. It might be because of drifting or blowing but that is just speculation.